The Field Notes Original Kraft 3-Pack was the first Field Notes memo book. It comes with 48 pages that measure 3-1/2” wide by 5-1/2” tall. The memo book is is bound with a rugged three-staple saddle-stitch process and comes with a tan cover. Graph paper - 3/16” (5mm) The original. Ruled paper - 1/4” (6.5mm) ruled paper. Good, crisp lines. Mixed Paper - One of each. Plain, ruled and graph paper. 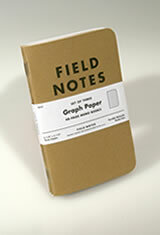 The Field Notes Original Kraft 3-Pack Memo & Notebooks usually ships within 1 business day unless otherwise specified. Each Field Notes Original Kraft 3-Pack Memo & Notebooks we sell is guaranteed to be genuine, authentic and will arrive brand new & unused! I like these and will buy to hand out to my colleagues. I like this. I have a passion for classic looking things and the way these notebooks take on a character when carried in the pocket. The old saying of not judging a book by its cover can be tossed when the book(let) is one of these. The cover itself tells a story of its own after use. I also use fountain pens, Lamy EF nibs so far and there has been no bleed through with any of the inks that I use. Simple product. I received just what I expected in a very timely manner. Are the pages weather resistant ( i.e. Like Write in the Rain brand). Field Notes notebooks and memo books have standard paper, and they are not necessarily water resistant. Not the pages on the Field Notes Original Kraft Notebooks are not numbered. They come in either plain paper, lined or grid but none of them are numbered.